We've been doing value work on AMD and with our new forecasts we come up with almost $1.25 EBITDA cash flow in the next 12 months. WE now have 55% earnings growth locked in for 2019 and that gets us to $42 valuation. Action to Take: HOLD the final position and add another position UNDER $30 on profit-taking. We will also add a $40 September 2019 long option on ANY big pullback. We should see some Window dressing at the end of the 3rd quarter (i.e., hedge funds and mutual funds want to make sure they have the #1 stock in the Nasdaq/S&P 500 on their books when they report Q3 positions). AMD is still way overbought and WAY extended over its 20-day trading average--gravity alone (profit taking) should bring it close to its support levels. It does NOT get any better than this in the stock market. While other tech stocks have been falling, our little GPU and CPU chip maker’s stock has gained a whopping 70% in the past month. The stock has more than tripled in value YTD (year-to-date). For those of you who bought AMD with us in early May 2016 at $4.25 AND took in over $4 of call option premium while we patiently waited for its new product lines to emerge, you literally have nearly a $0 cost basis at this point with our final $10,000 position now worth over $72,000 to those of you who followed our buy/sell calls advice. It’s now trading at a 12-year high. We did take profits on our 3X overweight and sold those final two positions at 600% and 226%+ profits on the 70% melt-up--we were 3X overweight AMD as you know. In our model portfolio, we entered 2018 with our original $30,000 (for the model we assume $10,000 in each position and options position). That original $30,000 turned into $274,000 not including option premium income. Many of you also made 2x-5X your money on our call option plays. We expect 55-60% EPS growth in 2019 over 2018--and that is on top of 150% ish y-over-year profit growth so far and higher EPS growth as their higher margin new GPUs and CPUs hit in Q3 and Q4 i.e., in the next two quarters. The stock has been surging on the back of AMD’s massive GPU (graphic processing units) end markets. Its new 7nm GPUs power a variety of rapidly growing areas, including the AI/ML (artificial intelligence and machine learning) which is an $18 billion market going to $190 billion and all run out of hyper data center spaces. And their new CPUs are finally competitive with Intel chips in the PC/Laptop world which is getting a refresh after years of drgging around heavy Dell/HP corporate laptops. AMD even is getting some love from the Esports wave that our other GPU monster Nvidia is dominating. As the graph above shows, the company’s revenue growth has been accelerating quickly in the last few quarters. Markets reward growth stories heavily these days. Is AMD close to its peak? Historically, AMD stock has had similar meteoric rises on two occasions: in 2000 and in 2006. On both those occasions, the stock crashed and stayed low for a long time. I don’t see it this time around. #1 Our new model and Wall Street expects AMD to become even more profitable over the next few quarters. AMD gross margins on their upgraded GPU chips from 7nm are killing Intel—they only can make 10nm and that extra size means more electrical power to run their chips. Intel (INTC) is slated to launch its next-generation chips last next year. If Intel releases an impressive line-up of chips and prices them AMD could take a hit. Plus today AMD is has a 12 month technology lead over Intel--Intel is not even shipping 10nm chips! The revenue growth opportunity in the artificial intelligence market is insane and enormous, recent studies have shown. The global AI market is expected to generate $190.6 billion in revenues by 2025, up from $16.1 billion in 2017, according to MarketsandMarkets Research’s estimates. Cloud computing and self-driving are among the factors fueling the growth of the AI market. AI chips are also used in systems that perform functions such as voice and facial recognition—can you say Alexa? Our favorite $23% yielder MORL 2X Mortgage REIT ETN is set for a short squeeze. 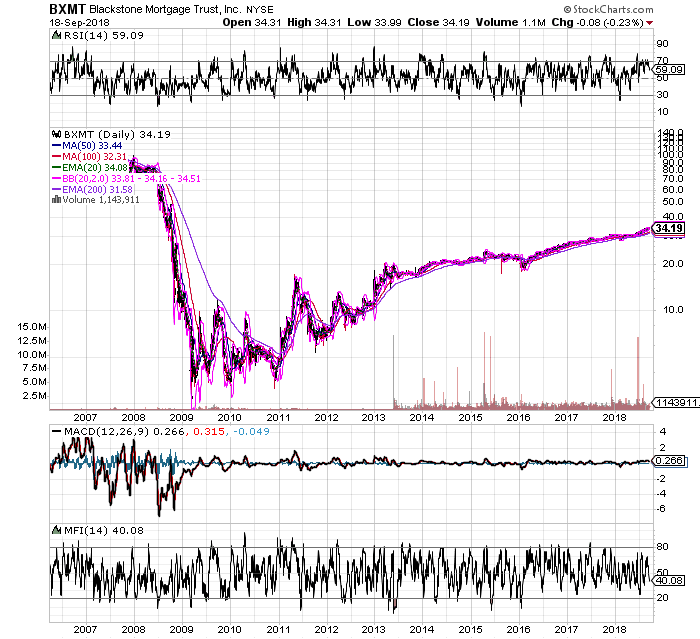 The sponsor has stopped selling units into the market so the ETN value now exceeds the underlying mReits value. MRRL is now under net value with 23.7% monthly yield. BUY MRRL Under $16.25 and reinvest dividends. ﻿Remember these are part of our $10K A Month For LIfe portfolio. 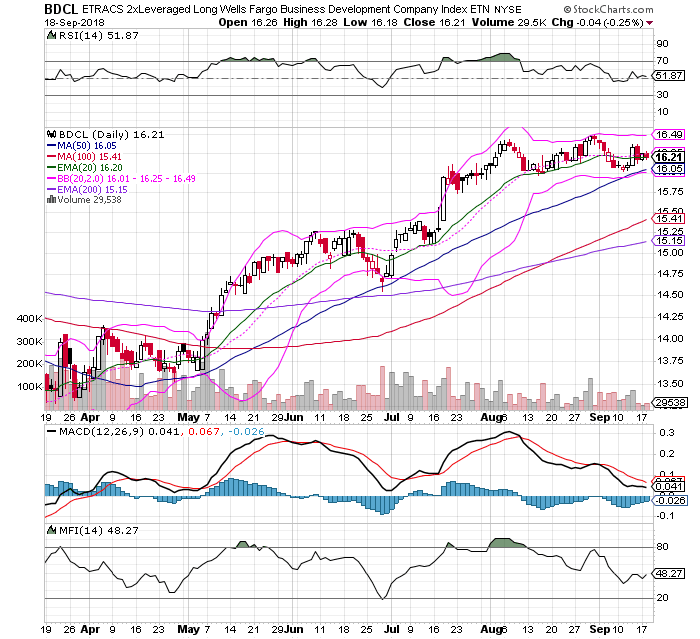 Newtek (NEWT) HOLD, New Residential (NRZ) and BDCL round out the lineup. The WHOLE IDEA is to buy there high yielding instruments and reinvest the monthly dividends into new shares. At 20%+ yield, you double your position in 5-years. As the Fed tightens short-term rates we should bounce around $15-$16 pricing BUT when the next recession hits yield we will hedge these positions buy use dividends to build our position at lower prices. The spread between MORL and MRRL is at a historic high. New buyers seeking the very high current yields should buy MRRL rather than MORL. Current holders of MORL may want to sell MORL and use the proceeds to buy MRRL and pick up yield. On an annualized monthly compounded basis, the yield on MRRL is now 23.45% as compared to 21.97% for MORL. The announcement that UBS will no longer issue and sell MORL precipitated the price movement of MORL that caused it to now trade above MRRL and their net asset value. There may be a short-squeeze in MORL. This can be a dangerous thing to be involved in but could be an opportunity for some. UBS ETRACS Monthly Pay 2x Leveraged Mortgage REIT ETN (MORL) has a twin which is identical in all economic respects, UBS ETRACS Monthly Pay 2XLeveraged Mortgage REIT ETN Series B (MRRL). They both pay very high dividends. While typically called dividends, the monthly payments from MORL and MRRL are technically distributions of interest payments on the ETN notes based on the dividends paid by the underlying mREITs, pursuant to the terms of the indentures. The annualized dividend yield on a monthly compounded basis for MORL is 21.97% with MORL priced at $16.87. However, as the dividends are identical, the annualized dividend yield on a monthly compounded basis for MRRL is an even larger 23.45% as MRRL is at $15.90. Again..the whole idea here is simple: WHEN of Transformity Research Macro Market Index is telling us a recession is 4-6 months ahead (at 17.9 reading we are not CLOSE) and we are ready to turn our long stocks and investments into high yielding instruments that down in value as the stock market craters/bonds yields skyrocket . Once we come out of the bear market, we have high yielding mREITS and repurchase BDCL and the skyrocket n value, (we will not kick out of NEWT because so many subscribers have an insanely low basis from reinvesting cash dividends and stock dividends it would be insane to sell). I'll get into the whole plan in the next 60 -days...it also involves interest rate hedging. Happy Yon Kippur and 25 Hour Fast...just think of the brisket to come Wednesday!